MaryAnn Kagga was born with a rare heart defect called Tetralogy of Fallot, which causes oxygen-poor blood to flow out of the heart and into the rest of the body. She’s only 18 months old. Sadly, like many children, MaryAnn lives in a country – Uganda - where the specialized care needed to help save her life is unavailable. Her condition could have been terminal. Fortunately, some Delta employees teamed with a charity to ensure that didn’t happen. Delta’s Fuel Management team, responsible for supplying jet fuel for Delta’s aircraft, reached out to Samaritan’s Purse, a North Carolina-based organization that provides aid to people in need around the world. The Delta people wanted to help make a difference in a child’s life. Over the past 18 years, Samaritan’s Purse has arranged for live-saving surgery for more than 1,000 children from 15 countries. The group identified MaryAnn for the Delta team. 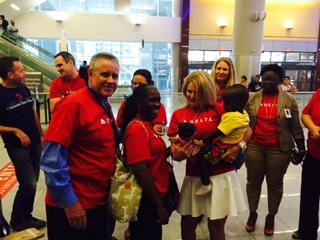 In partnership with Samaritan’s Purse, the Delta Fuel team provided round-trip air tickets for MaryAnn, her mother, Maureen Komuhangi, a translator and a U.S. doctor to fly from Entebbe, Uganda, to Houston where MaryAnn would undergo the life-saving heart surgery she needed at Hermann Memorial Children’s Hospital. Upon arrival in Atlanta for their connection to Houston, the Delta Fuel division greeted MaryAnn and her mother, presenting her with a hand-stitched, airplane-themed quilt made by Fuels team member Judy Laveer, and ensured the family made it safely on to the last leg of their long journey to Houston. Graeme Burnett, Senior Vice President-Fuel Optimization, said, “It is a great feeling to be involved in getting MaryAnn to Houston so that she could have the heart surgery she needed and hopefully save her life. It was a very special and emotional experience meeting MaryAnn and her mother. For her part, Komuhangi sank to her knees and wept when met by the Delta people. MaryAnn underwent successful heart surgery on Aug. 12 and recently returned to Uganda. Fuel team member Morven McCrindle accompanied MaryAnn and her family on their trip back to Entebbe. On returning from Africa, McCrindle wrote her colleagues: "I wanted to pass along the sincere gratitude to Delta expressed to me by both MaryAnn's family and also the local Samaritan's Purse Uganda chapter team. The generosity by Delta to help make MaryAnn's surgery possible in addition to the incredible heartfelt warmth felt from the thoughtful gifts received, to the interactions during transits, to the follow ups were not only recognized but left an overwhelming and lasting impression to all involved." In a card to the Delta team, MaryAnn's family wrote: "Thank you so much for the love that you have shown to us Ugandans and my daughter as well as my family. God Bless you. From MaryAnn, Maureen, and family."